Disclosure: I received the CW By CorningWare ™ 4-Pc. Set for feature. All opinions are my own. I have realized that since I have gotten older, the things on my wishlist have shifted. I'm not saying that my love for extravagant gifts has dissolved, but my love for home goods has heightened. I grew up with Corningware and the holiday dishes were always presented in them. 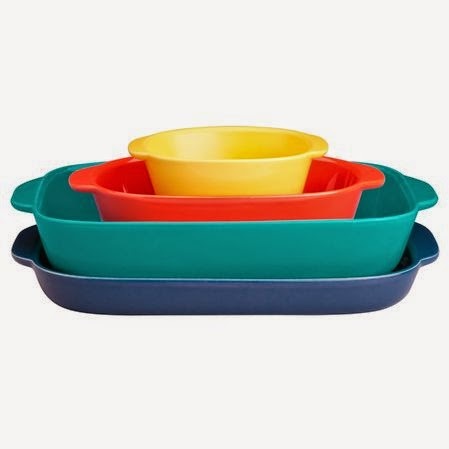 Casserole dishes are so versatile and can be used year round and the colorful CW by CorningWare™ set is just awesome. This durable stoneware can go straight from the oven and/or microwave to your table. The vibrant colors are festive and you can mix and match to fit the decor of the moment. I love that they nest inside each other for compact storage. These are a wonderful housewarming gift as well as hostess gift for the holidays. Or you can just update your own CorningWare stash with these bold dishes. Are you a CorningWare fan? What are your favorite pieces? One winner will Receive a Corningware Pop Mug! French White® 8-Pc Casserole Set! I love the Corningware® etch® Brick 4-pc Bakeware Set. Love the 7 pc casserole set. It is lovely in white and so handy. I like this one: Corningware® French White® 12.5" X 9" Serving Platter. I could use the 8 cup measuring cup. I love every piece of Corningware! I grew up with my Mother using it to cook. After looking over the site, my favorite is the Corningware® French White® 3-qt Portable w/ Black Carrier. French White® Cast Aluminum™ 4 Quart Oval Tomato (Red) Braiser W/ Glass Cover. I like the Lodge® 10.25" Skillet / Frying Pan! Anything is what I love, ANYTHING, I love it all. I like the Corningware® French White® 7-pc Casserole Set . I would like to have the Corningware® French White® 3-qt Portable w/ Black Carrier. I would really love to have the Corningware French White Cast Aluminum 4 Quart Oval Tomato (Red) Braiser w/ Glass Cover. I love the Pyrex® Portables® 4-pc Set. It would come in handy this holiday season! I would like the Corningware Stovetop Pyroceram Shadow Iris 3L Casserole. I'd also love the Corningware® Stovetop™ Pyroceram® Just White 2.5L Saucepan! I also like the Corningware® CW by CorningWare ™ 3-qt. Pool Baker. I really like the EKCO® Measuring Cup Set. Their shape is unique. I love the Happy Days dinnerware set. It's so cute! I would like to have the Corningware® Etch® Brick 4-Pc Bakeware Set. Corningware® Etch™ Blue Cornflower 2.5 Quart Oblong w/ Lid. I like the Corningware Stovetop Pyroceram Shadow Iris 3L Casserole. I like the Corningware French White 12 pc. Set. I love the Corningware Stovetop Pyroceram Just White 4-Pc Casserole Set! I love the set you showed - Corningware® CW by CorningWare ™ 4-pc. Set - it has all the colors! But I would also love the Corningware® etch® Eggplant 3-qt (9” x 13 x 2”) Oblong Baker - such a gorgeous purple color! 10-Pc Hard Anodized Set. I need new cookware.